Sport can offer the chance for quality time for you as a couple as well as quality time for the whole family. It is all too easy to lose sight of you as a couple after you have children and put their needs first all of the time, neglecting your relationship. So while playing sport as a family is a great way to bond as a family, it can also be used to give you some quality couple time as well. When you choose the sport or form of exercise to play, the main focus may well be on the children and whether they are enjoying it or not. But if you want to be able to use that sport as a way of spending quality time together as a couple you must think about the potential for carrying on with it when you and the children’s standards diverge. So you may think about choosing swimming as an activity because it is something you can all do together when you are splashing around at the local pool. But if the children take it more seriously and start to train properly, competing in galas, is it something which you as a couple will still do together? If you think without the incentive of the children you will not continue exercising, choose something you will still want to do. 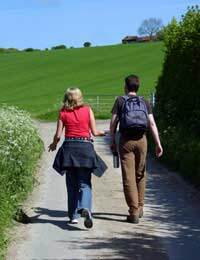 This could be walking or running – something which you can build into a hobby for the two of you. This really, is the crux of the matter. If you want to turn sport into something which allows you to spend quality time together, it must be something you enjoy as a hobby. In this way, you can start to do all kinds of related activities. So, it is all very well playing squash together once a week but if you do not do anything else with those skills or use them in any other way, then you are doing it simply to keep fit and not to spend quality time together. But if you take up walking, you can build this into long weekends away hiking. Similarly, if you join an actual sports club, there may be social events and weekends away at tournaments which will make you sport into more of a pastime which you can share together. Shared interests are vital for any couple. No-one says that you cannot have separate interests as well; in fact, this is to be welcomed. But some shared interests are needed – otherwise it is unlikely you will ever have anything to talk about. This is particularly important if you have children who are starting to develop their own lives and interests and who may not be at home all that much longer. Spending quality time together is about more than collapsing in front of the TV at the end of a hard day, although this does, of course, have its place. Quality time is more about doing something together, which you both enjoy, which enriches your life. In short, something like sport.